Save the date. Halloween events are popping up all over Chi-town. One of our favorites was just announced. 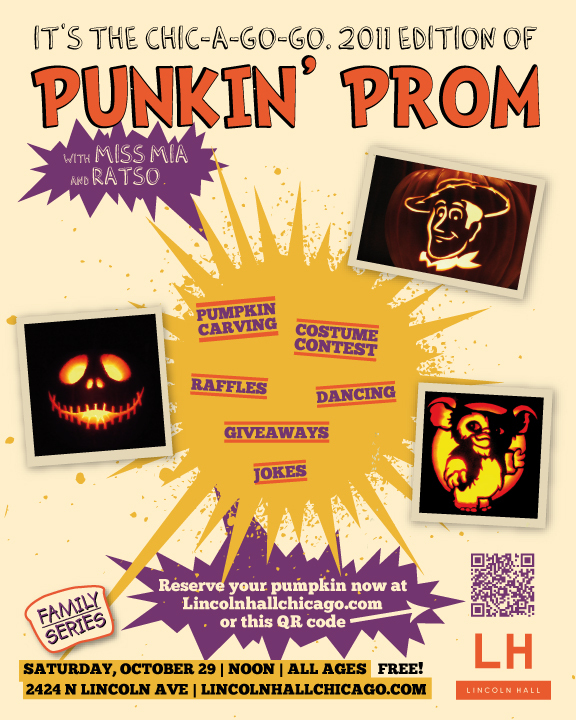 ChiIL Mama can't wait for the 2nd annual Punkin' Prom with Miss Mia and Ratso from Chic-A-Go-Go at Lincoln Hall! Last year they sold out, so reserve a pumpkin for your punk kin NOW and mark those calendars. ChiIL Mama, Sagezilla and Du-Jay will be there. Come join the fun. Last year we also had a blast at the taping of the Chic-A-Go-Go Halloween Show taping. Want an extra excuse to wear your costume? Wanna rock out on TV with your littles? Wanna hear some fun, new bands? The tapings are open to the public. This year, it's happening Saturday, October 1st. Check it out! All ages welcome.